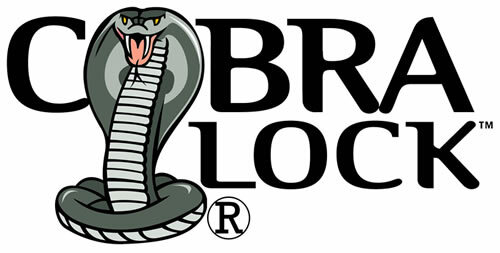 Locking Systems International Inc. can manufacture T-handles in a variety of shapes, sizes and functions. Our standards are the "screw" type and the "90 degree" type of T-handles. We can also custom design and manufacture T-handle in the color, texture and function that will serve your exact needs. The standard material for construction is zinc die-cast, however stainless steel is a good option for applications that require higher security. For Additional Information and to Download out INFO Sheet with Dimensions Click HERE. 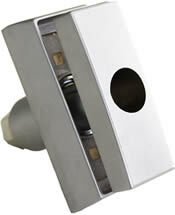 Our screw type T-Handle is designed to fit all standard t-handle mounting holes. Constructed out of zinc alloy with a bright chrome finish . 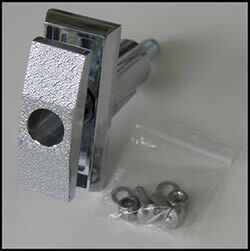 Body is the standard 2-3/8" and comes with a 1-1/2" locking bolt. Locking bolts of different lengths are available. The handle is solid for extra security. All mounting hardware is included.